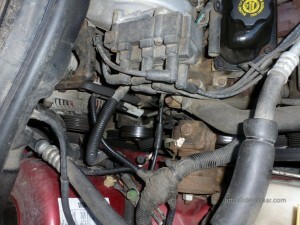 Recently I had to replace the serpentine belt in my 1996 Plymouth Grand Voyager LE. These belts used to be called “fan belts” in olden times when they used to mainly drive the fan, and sometimes are also called “accessory belts”. This same van. Pretty much the same vehicle as a Chrysler Town and Country or Dodge Grand Caravan of the same era. Mine has the 3.8L V6 engine. Belt replacement procedure is apparently similar to what is needed for the 3.0L but the 2.4L version will be different due to a different belt tensioner and different accessory pulley layout. “Serpentine” is a good adjective for the belt in the 3.8L since it takes a tortuous path around no less than 7 pulleys. And yes, the first three people aware of this repair all immediately thought of this great flick, re Serpentine! Serpentine!. Tools needed: all you need for this job is a 15mm box wrench and a sturdy extender to help you get some torque on it. The wrench is for rotating the belt tensioner (saves buying the special service tool for that job), but see more details about that later. In my case, for an extender, I used a 40cm length from a broken windsurfing mast, with a hose clamp tightened around base of it to stop the mast section from cracking (the torque in an earlier attempt cracked another mast section). See picture in the following. A steel pipe might be better if you have one with a large enough ID for your wrench. Alternately, if you have a really shallow 15mm socket and ratchet set, you might be able to get it on the tensioner bolt, but in my case even my Stanley low profile ratchet and 15mm socket were too thick to fit in engine space beside the tensioner pulley. Another more desperate alternative I didn’t try might be to use vice grips to hold a socket and rotate it, but you risk damage to the socket that way. The pictures below show the location of the tensioner pulley high on the passenger side of the engine. I put my box wrench on the bolt on it from above, with it oriented vertically, and then slid my wrench extender onto it. I found that I needed to rotate the tensioner bolt clockwise at least 60 degrees (by pulling the wrench extender towards the front of the vehicle) to take enough tension off to get the old belt off, and put the new one on. Be careful to position the wrench such that you aren’t pulling excessively on wiring and hoses when you rotate it. Keep track of the original belt path. If you have a camera handy, you might also want to take a picture of it for later reference. Also refer to the belt layout map that is probably stuck on the vehicle near the front of the passenger side engine compartment. When you put the new belt on, you can start with the tensioner in normal tensioned position. Put the belt on the lowest pulleys first, and around the alternator and tensioner pulleys, and around the front-most pulley. Just skip the ungrooved pulley in front of the tensioner. Next, use the wrench and extender to rotate the tensioner forward. 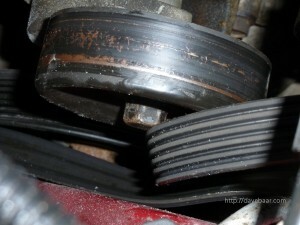 That should give you enough slack to get the belt onto that final pulley. I found I needed to rotate my extender about as far as it would go, about 60-70 degrees. Actually, an assistant might be helpful at this stage to rotate and hold wrench while you put the belt on; in my case, I was able to barely get the belt on singlepersonly while holding the wrench too, and after significant belt wrestling I succeeded in getting the belt on just as my friend Rob arrived to help out (sorry, Rob!). Before you start up your engine after this job, do a thorough inspection: be very careful with all the grooved pulleys that the belt is properly centred and aligned on them, and make sure that you have removed all your tools from the engine compartment and belt path. Belt alignment on the grooved pulleys is tricky, especially with the lowest pulleys, and you might need a flashlight to check them. Finally, check your belt path against the layout map on your engine. Hope that helps anyone. Happy Repairing and Happy New Year! Make sure there’s no fluid on the belt. To do this, look and feel to see if the belt is wet or oily. Actually, you don’t want the belt to be utterly free of oil. If it was, the belt would be cracking and breaking. There’s a lot of oil in most rubbers, intrinsically, both synthetic and natural types. Some belts do feel oily right from the factory, but put some metal against them and see if they slide or not. Rubber is fun stuff.